The Hotel Alexander on West 94th Street is one of many hotels that will go out of business when a new law takes effect in May. UPPER WEST SIDE — Owners of an Upper West Side building that's about to become a homeless shelter are offering tenants $50,000 and three years of free rent if they move out. 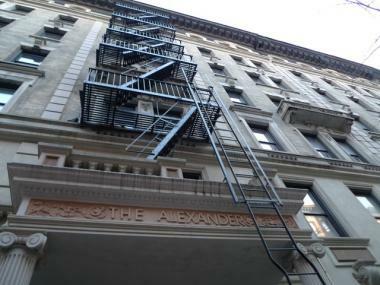 The landlords at Hotel Alexander on West 94th Street have told tenants they can move into a freshly refurbished room in a building next door if they take the offer, said Marti Weithman, director of the Goddard Riverside SRO Law Project, an advocacy group advising the tenants. The hotel owners need to clear out the building to make way for a 200-bed transitional housing facility for homeless men, which will be operated by nonprofit Samaritan Village under a nine-year, $8 million-a-year contract with the city. Rep. Charles Rangel, City Councilwoman Gale Brewer, Borough President Scott Stringer and Community Board 7 chair Mel Wymore rallied against a proposed homeless facility on West 94th Street. "This is one of our main concerns about the city putting [homeless facilities] in SRO buildings," Weithman said. "It’s a lot money and there are high stakes for these owners, and we see tenants forced out. This is permanent housing that we’d like to see kept as permanent housing." Neighbors and local officials have condemned the homeless shelter plan because they want the Hotel Alexander, a single-room occupancy building, to remain affordable rental housing for low-income people. 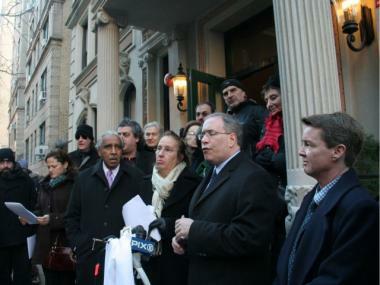 Rep. Charles Rangel, City Councilwoman Gale Brewer and other officials rallied against the shelter last Sunday. 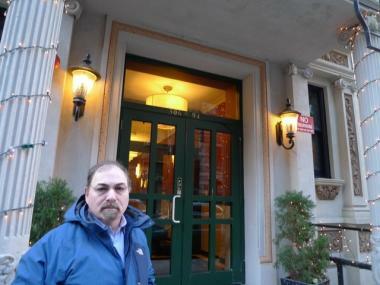 The building has been operated in recent years as a hotel catering to budget-minded tourists, but a new law makes it illegal to use SRO buildings like the Hotel Alexander as hotels. The law was intended to preserve SRO buildings as affordable housing, but instead building owners who are being forced out of the hotel business are signing lucrative deals with the city to use the buildings for homeless services. Now the very people the new law was intended to protect — the Hotel Alexander's permanent tenants — are being pressured to leave to make way for the new homeless shelter. Tenants in the building include a school cook in Brooklyn who pays $439 a month and a food service worker who pays $392 a month for a single room with hot plates and bathrooms down the hall. Weithman said none of the building's eight permanent tenants had accepted the buyout offer. Aaron Biller, president of Neighborhood in the Nineties, says locals would prefer the Hotel Alexander remain a tourist hotel instead of turning into a transitional housing facility. "$50,000 for eight tenants is not all that much, considering the incredible amount of money the owner is being offered," Weithman said. Aaron Biller, president of neighborhood group Neighborhood in the Nineties, called the buyout offers "an outrage." "It's opposites day in the city," Biller said. "Legislators are fighting to pass a law to create permanent affordable housing, and here’s the city pushing out permanent people. Using taxpayer money to buy out permanent tenants to create temporary housing (for the homeless) is complete nonsense." The Department of Homeless Services could not be reached for comment.